The purpose of the procedure is to provide process guidelines for maintenance, tool identification, storage and preventive maintenance of tool. Tool maintenance: Maintenance Management is define and implement procedure for tool maintenance. This procedure is enhance productivity, reliability of tools, and efficiency of related engineers who are manage tool maintenance activities. The tool maintenance procedure is provides the structural guidelines. The procedure is used for follow for all tooling related maintenance, tool identification, storage of tools, and preventive maintenance activities. The procedure can applicable to all the storage areas of tools, maintenance and production line where used the tools. Design Engineers and maintenance team are manage preventive maintenance related activities and identification of related of tools related processes. For the maintenance activities, each tools should be identify and managed as per required category as per its condition. Based on the tool condition, tool maintenance will put the specific labels or sign to easier for identified category by storage department. The designed areas should be maintained and stacked tools as its defined and accepted category. There are simply maintained color codes and specific numbers that easier for identify ready tool or current tools. Under preventive maintenance tools and obsolete tools, which are no long in use or damage condition. The design engineer is responsible for define tool identification for each tool with unique number. In case any tools are customers or third party property that should be indicated specific color or unique number. it will be easier for identify and tracking each one, during any operation. In case any tool damages or loss, organization will inform to customer and appropriate actions are take accordingly. There is important for the tooling storage for the maintain tools properly. Tools are stored in the specific rack as designed for maintain tools. With proper racking system and index for easy identification, stacking and retrieving at appropriate locations of storage. The tools are properly preserved and monitored by related employee timely. Tool maintenance procedure is implement and effectively apply to conduct machinery, equipment and related activities. General working flow is the engineers are comply maintenance requirement for tools. The tool maintenance conducted as real time maintenance called break down maintenance and preventive maintenance. In the breakdown maintenance activities conducted when tool problems occurred during the production shall be recorded in register by concern supervisor. And needs to communicated to tool room / store room for correction specific identification labels. The preventive maintenance activities are managed as per scheduled by maintenance manager. Or as per concern department supervisor communicated for conducting preventive maintenance in rear cases. The store room supervisor should correct the tool and details recorded in the registers. The preventive maintenance records are maintained as per scheduled and checklist filled by maintenance engineers. On after correction of tool maintenance needs to maintain records on acceptance of concern department head. In preventive maintenance reporting and records are maintained in the history card format by acceptance sign of concern department head. It is important for tracking & storage, design / maintenance engineers are identify each tool with it’s unique identification number. It is industrial practice that sometime customers are providing tools for specific product requirement. 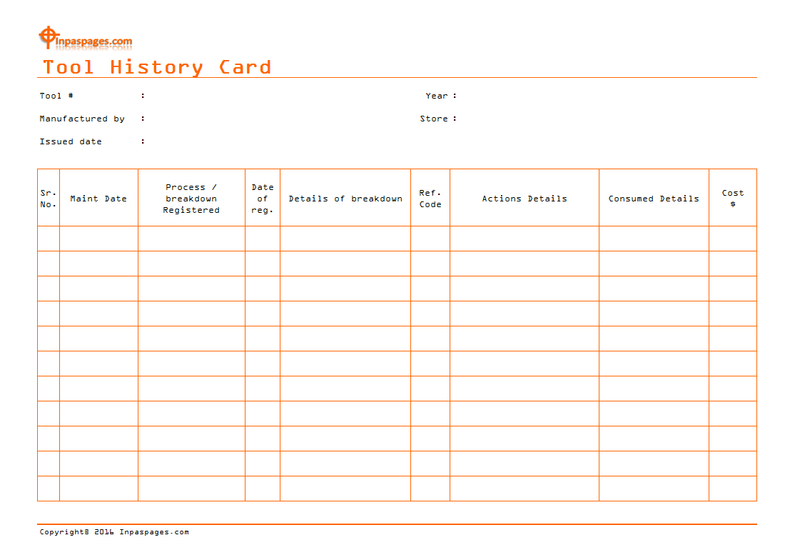 Each customer provided tool are identified by any tag, color code and unique number. Customer supplied tools are manage separately is recommended. In case any damages or loss with tools that immediate inform to customer. Take appropriate action in concern. Always keep the tools in metal rack, structural / designed and easier for access is important for every storage unit. Each tool should proper index for easy identification and retrieving. All the metal tools should be preserved by applying sufficient volume of oil or spray to avoid deterioration and damage. What to do for tools breakdown maintenance by effective way? In case of any tool problems identified during the production shall be recorded in tool history card by concern supervisor. And require to immediate communicate with tools room authority for correction. Marketing on specific / defined color code is recommended which tools identified problems. Tools room supervisor should maintain the records as identified tools with problem. The best manufacturing practice is to implement system to each tool before taking in the production should be signed and accepted by concern authority i.e. production and quality engineers. What to do for tools Preventive maintenance by effective way? Define Standard system for tools used in production lines should be maximum used period. Utilization or any specific use volume, in case of the cross limits tool will be taken for preventive maintenance. Production line’s supervisor should record the information of tool utilization and communicate with tools room for preventive maintenance by specific marking on it. Tool maintenance peoples will carryover the preventive maintenance, checklist is best option for conduct maintenance. Each details of preventive maintenance are recorded in the tool preventive maintenance checklist to easier for further actions. Standard schedule / planning is important for preventive maintenance. Each tool is recorded for maintenance and next schedule to easier for tracking and releasing for production lines.